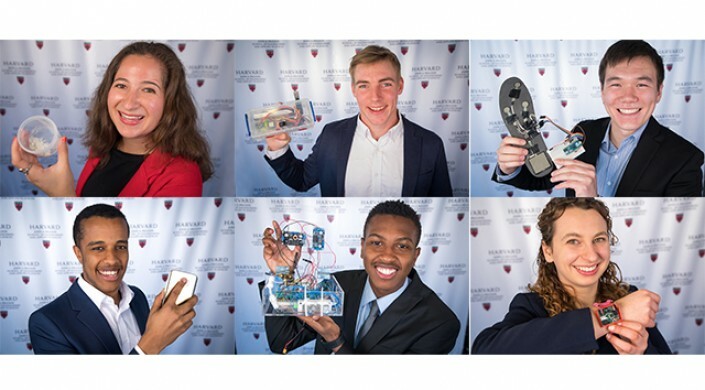 Whether they set out to fight childhood cancer, improve cardiovascular disease diagnosis, or measure deadly neurotoxins in the atmosphere, the students in “Engineering Design Projects” (ES 100) focused on making an impact. The capstone course at the Harvard John A. Paulson School of Engineering and Applied Sciences challenges seniors to engineer a creative solution to a real-world problem. Each year, thousands of patients undergo surgery to treat cholesteatoma, a benign buildup of skin cells in the middle ear. Surgeons remove a portion of a patient’s ear canal wall and reconstruct it using bone chips, but this procedure often leaves patients with at least a 15 decibel hearing loss. To improve post-surgical outcomes, Friedman developed a biocompatible, 3D-printable implant that has similar mechanical properties to bone. Her implant, created from a novel mixture of a biodegradable polymer and hydroxyapatite, is customizable so it can be rapidly tuned to the size and shape of a patient’s ear canal. The biggest challenge she faced was synthesizing the material from scratch, and then troubleshooting bugs that cropped up as she tried to incorporate a brand new material into a 3D printer. In rowing boats that don’t have a dedicated steersperson, one of the rowers steers the boat using a pivoting shoe with attached rudder wires. But steering the boat this way is difficult and distracting, often causing drag on the boat that could shave precious seconds off a team’s competitive time. Meijer set out to develop an electronic steering system that uses GPS data to automatically steer a boat. The guidance controller he developed uses the current position of the boat and inputted information on the course the rower wants the boat to travel to generate a waypoint that minimizes the distance between the boat and the desired course. The system then sends commands to the rudder to steer the boat along that course. Meijer’s biggest challenge came down to effectively modeling the boat using computer simulations, and then integrating the different sensors into the electronic device. For individuals looking to track their health data using wearable technology, it’s all in the wrist—nearly every wearable health tracker, from a FitBit to an Apple Watch, is a wrist-worn device. But these devices have drawbacks, most notably potential problems with comfort and aesthetics. To overcome these issues, Akker created a health self-tracking system that is integrated into a shoe insole. He incorporated pressure and altitude sensors into an insole that is less than half an inch thick. The electronic components track the number of steps an individual takes, hours spent standing, and the number of stories climbed, providing data that can help people live more active lives. For Akker, narrowing the scope of his project and limiting his focus to the features that would be most useful for target customers were the biggest challenges. While volunteering in Ethiopia, Daniel Ayane noticed that many people he encountered suffered from preventable cardiovascular diseases. Lack of access to health care is a major problem in the east African nation, which has .25 doctors per thousand residents (as opposed to 2.58 doctors per thousand residents in the U.S.) Yet 500 million Africans have access to a smartphone. So Ayane sought to develop a web app that uses a smartphone’s sensors to measure an individual’s blood pressure. The website he created uses machine learning algorithms to record heart rate, systolic blood pressure, and diastolic blood pressure, then provides a risk level based on how those readings compare to medical standards. The app generates a report in only five seconds and keeps a record of the patient’s history that he or she can use to inform future health care decisions. Gaseous elemental mercury in the atmosphere is often deposited in the oceans and soil, where it can be converted into methylmercury, a deadly neurotoxin. Measuring the amount of gaseous mercury in the atmosphere is difficult, due to the weight of monitoring equipment and the challenges of reaching high elevations. To solve this problem, Brown engineered a lightweight, portable device that can be attached to a drone to measure mercury within a column of the atmosphere. His laser-cut device measures mercury using gold traps, which are glass tubes that have patches of gold in the middle. As air flows through the tube, mercury sticks to the gold, enabling researchers to determine the concentration in a certain sample of air. Brown’s device also incorporates measurement devices so temperature and pressure can be tracked as it rises into the atmosphere. Only 20 percent of pediatric cancer patients living in low- and middle-income countries will survive. Many of these deaths are due to infections, which arise because of treatment delays that are compounded by a lack of education on the signs and symptoms of infection, such as fever. To alleviate this crisis, Dahl designed a wearable device that monitors a child’s skin temperature and sounds an alarm when the temperature exceeds a safe threshold. The wrist-worn device, which incorporates temperature sensors and a miniature microcontroller, is very power-efficient, so it can be used for a long time in rural settings without being recharged. Every four hours, it records the child’s temperature and stores the information in a database. If it detects that the child has a fever, it will conduct additional measurements to ensure the reading is not anomalous, and then sound an alarm to alert a caregiver. Dahl’s device is based on a project she and her classmates first prototyped last year in Engineering Problem Solving and Design (ES 96).